Improvement in quality of photos and videos using software correction colour has always interested filmmakers and photographers. It not only contributes in increasing the number of directly interested viewers but also provides influential and compelling aspects to the clip. 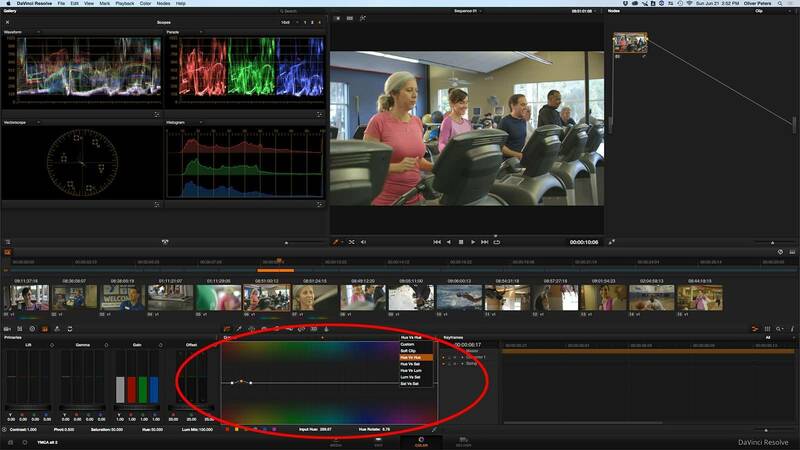 DaVinci Resolve enables users to enhance the output quality of videos and images. Its various features contribute in proper finishing of the video. The colour grading tools are so sophisticated and that is the reason that this tool is being used worldwide for editing various movies, commercials and music videos. This post is to make you familiar with 5 of its exciting features which can help in making your image more pleasing than a flat, long-encoded capture! If you are looking for an easy way to correct your video color, you should try FilmoraPro. Auto correction will save your a lot of time and energy. With high-quality presets, you will get cinematic effects. If you want to correct color manually, you can adjust the white balance, HSL, vigmette, 3D LUT and more. Download it now to have a try (Free)! If your base image is not well balanced then there are bound to be some small exposure issues. Therefore it is necessary to adjust issues at this stage- not before or after as great color corrects demands a well-balanced image. DaVinci Resolve helps in refining the colors of the pictures and video in easy manner using its primary color correction tools. Using color wheels and sliders it is faster and precise to adjust colors for setting lift, gamma & gain. This amazingly adjusts the contrast, tone, shadows and temperature of the picture. The color scheme leaves a profound effect and maintains color relationships to even the surface of the clip. Some of the clips are just perfect when shot but its consequent picture doesn’t turn out to be so impressive. Low color bit depth, poor codec, inaccurate sensor calibration, inappropriate lens or issues with filter usage ends up in affecting the skin tones visually. With curve grading feature of DaVinci Resolve, you can adjust the hue, saturation and luminance of the picture in the frame. The oversaturated greenish, purplish or bluish skin tones can no longer spoil you clip. You can tweak the colors and make quick and subtle color arrangements by using Hue vs Hue or Hue vs Sat options. You can boost or reduce the saturation and hue to carve out a picture which makes skin look natural and pleasing to the eye. If you want to give that ‘magical’ look to your image then custom curves of DaVinci resolve can help in putting that up with its editing algorithm. Extreme registers of highlight or shadow can be limited or eliminated using the feature of custom curve and soft clipping in Resolve. It helps in shifting low and high ranges of the image while retaining its ‘filming’ look. 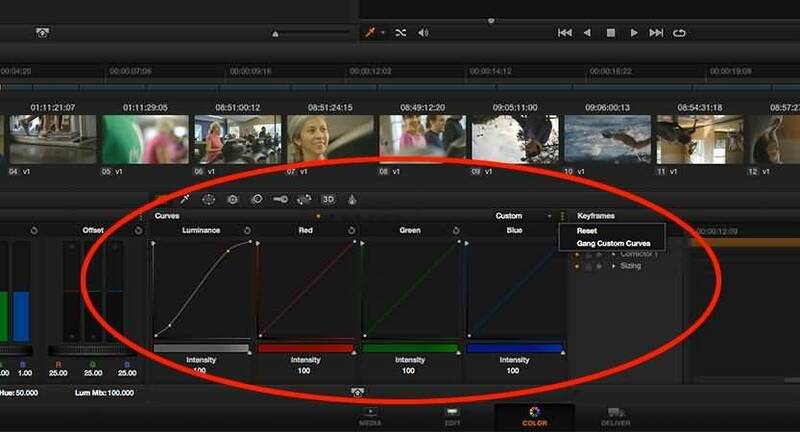 This feature of Resolve can be ganged for all channels or set per channel. If you want to just adjust one then make sure to disable ganging before you start as otherwise it will adjust the entire gang. It can be used as a creative technique to emulate images as it ensures that edges roll smoothly and softly into the rest of mid-tones. It can be really tedious to cut the clip manually and it is not so easy to analyse a single file! There is a requirement to chop it into multiple shots to carry out proper editing of each and every scene in the clip. 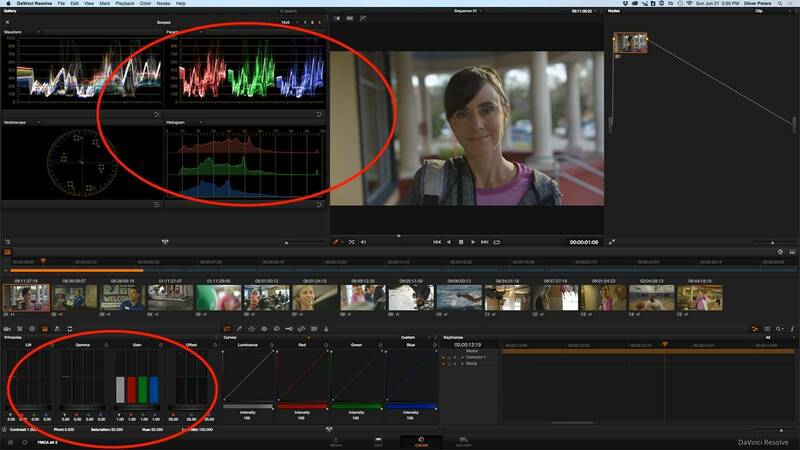 DaVinci Resolve helps in conducting this simply using ‘Scene cut Detection’ option. After you initiate the slicing, vertical green lines in the panel represent the detected cuts and the purplish/magenta line is the threshold of detection. Any lines above this line are included and the below ones are excluded. This tolerance bar can be dragged as per the requirement. Like now you have trimmed the video through context sensitive trim tools but how do you want to handle the video dissolves that exist in master file? Just like many professional audio tools handles fades and transitions, similarly curve editor in DaVinci Resolve helps in tuning the dissolves finely. This means that dissolves can now be customized and tweaked with much more flexibility and ease. If you get hold of control functions including trimming and adding dissolves then editing clips is a cinch for you! Just to add further to it, if the texture consistency of the clip can be affected by different people and processes then it is always better to apply noise reduction after first light! If keying is involved, then doing it early helps in obtaining a ‘clean’ source image.